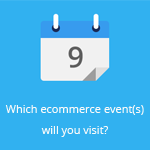 February 26, 2015 by Ecommerce News. About Mobile, Statistics with tags Europe. 14412 views. Europeans are set to spend about 45 billion euros via mobile devices in 2015, an increase of 88.7% on 23.8 billion euros in 2014. PC spending on the other hand, will grow by just 6%. 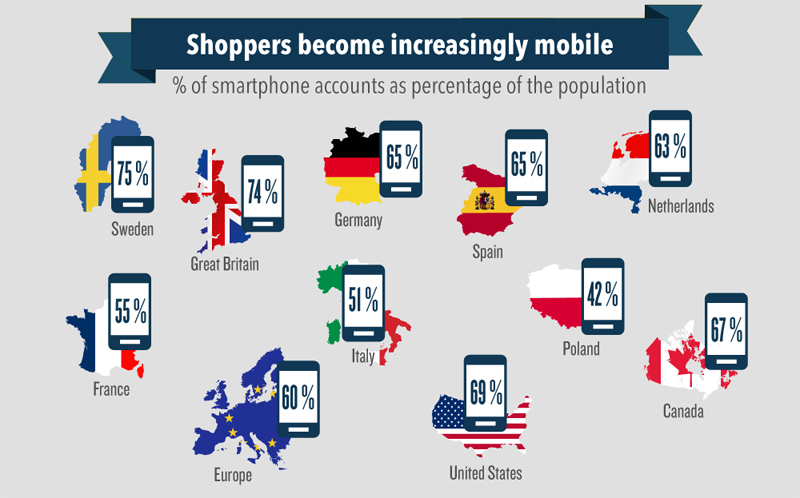 In Europe, 12% of all online purchases has happened through mobile devices. These figures come from the latest research by RetailMeNot, a global marketplace for digital offers. 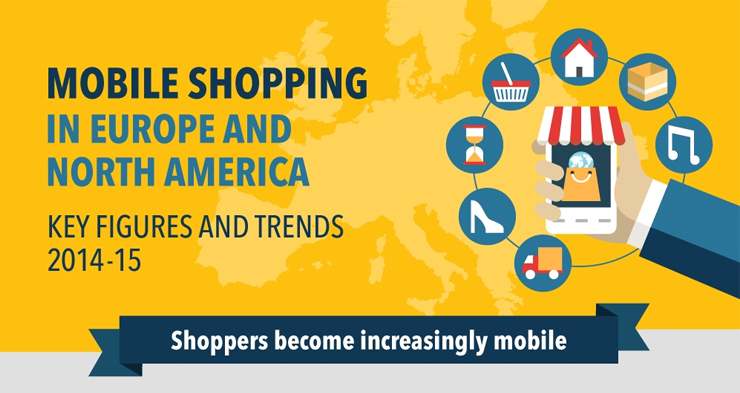 It compared mobile shopping in Europe with mcommerce in North America. It seems that the adoption of smartphones is still higher in the United States, where 69% has a smartphone. 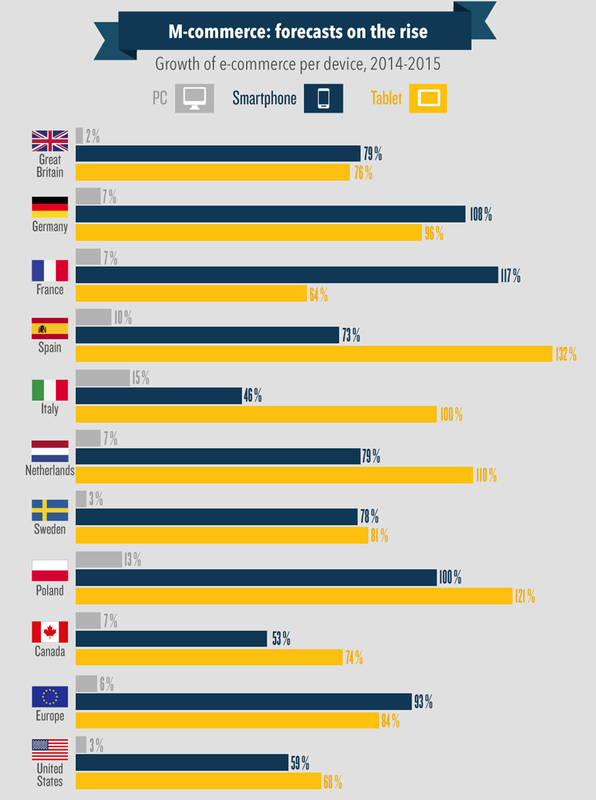 In Europe the average is slightly lower with 60%. Of course, there are some differences between European countries. For example, in Poland just 42% of the population has a smartphone, while in Sweden three in four inhabitants own one. Another thing where the US scores better than Europe is in the field of visiting ecommerce websites. 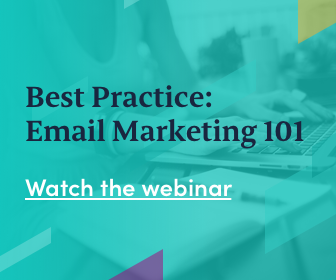 In the US 74% of the users surveyed have visited a retail website within the previous three months, while in Europe on average only 46% did. This is of course due to the fact Europe consists of countries where there are still few people who shop online. In Italy for example only 15% of its inhabitants visited an ecommerce website, while Poland (24%) and Spain (28%) achieve only slightly better. 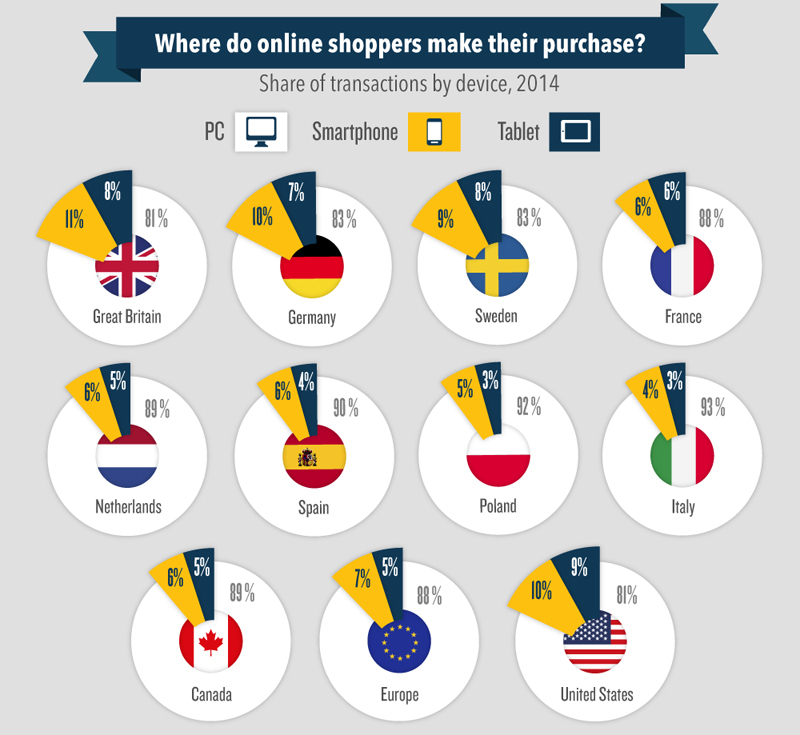 The PC is still the most preferred device for shopping online. This applies to both the people in Europe and the US. From the eight European countries surveyed, only the United Kingdom, Germany and, to a lesser extent, Sweden can keep up with the USA, where 10% of transactions happened by smartphone and 9% happened by tablet in 2014. RetailMeNot also looked at the share of spend per device in 2014 and forecasted how this would develop in 2015. In the US, 182.1 billion euros were spent online using a desktop computer, while online spending on a mobile accounted for 41.9 billion euros. 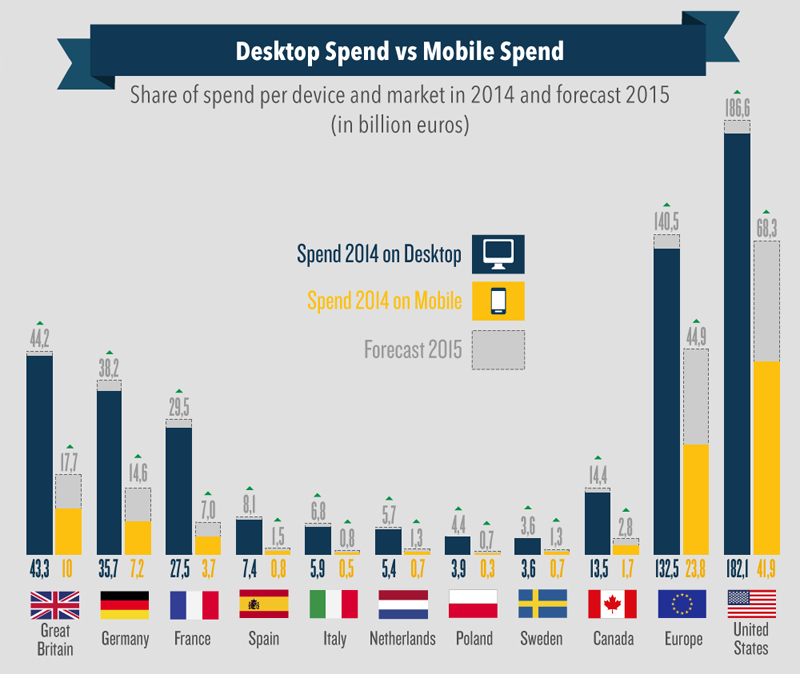 While desktop spending is expected to increase little, mobile spending will increase by 63% in 2015. In Europe, 132.5 billion euros were spent on a desktop computer, while this will probably grow to 140.5 billion euros in 2015. And mobile spending accounted for 23.8 billion euros last year, but is expected to increase by 88.7% to 44.9 billion euros. Again it shows that the UK, Germany and France are the major ecommerce players in Europe, as they together are set to account for 87% of all mobile spending in Europe in 2015. 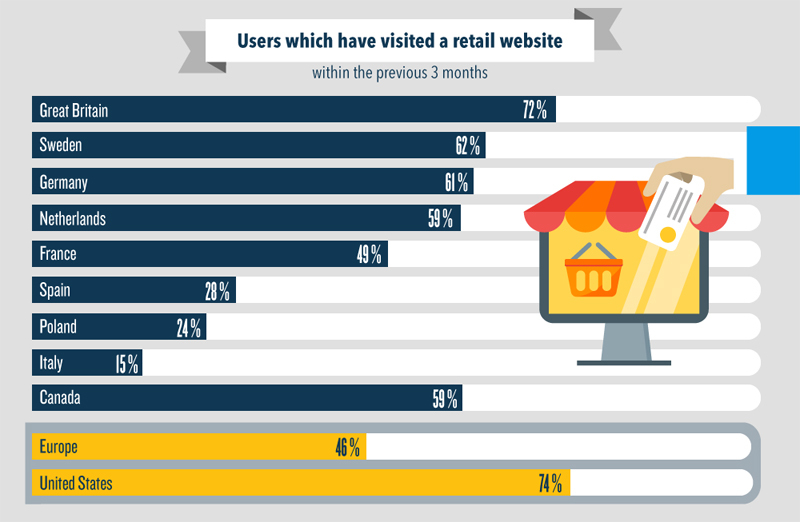 RetailMeNot based its infographic on a report carried out by the Centre for Retail Research in January 2015. The study analyzes online retailes sales in 2013 to 2015 in France, Germany, Italy, the Netherlands, Poland, Spain, Sweden, the UK, Canada and the US.